Eye On Tampa Bay: Won't get fooled again! Here we go again: Rail Round 2. Did “they” hear us in 2010? Apparently Not. They are playing the same game as other cities that were forced to go through multiple ballot referendums before they got the rail agenda passed. The Tribune is leading the rally for rail again. Once again, we have some questions. Where is “this urban area” they are asking for better mobility? Is it the entire city of Tampa? Is it the urban core downtown? Is it the Westshore business district? Are the suburbs like Carrollwood, Brandon, Lutz, Apollo Beach, Plant City, Town and Country, Westchase, and others included? What about “better mobility” in the rest of the County where the majority of residents live? Are they also included in this “private conversation”? So far, this appears to be a rather one sided conversation. How much time will we save? How much congestion will be relieved? How many cars will be removed from the roads? What will be the true ridership numbers? What are the risks to the taxpayers of Hillsborough County? Will bus routes be negatively impacted by rail options? This is based on data from 2008. These costs and subsidies data have not changed much in the latest numbers from 2010. But certainly our federal debt is much worse, which is of concern since significant funding for these transit project is expected from the federal government (with inconvenient strings attached). That spigot of money is likely to end well before these grandiose projects are near completion. "Personal cost" is the cost paid by the user -- in the case of transit it is the transit fare. In the case of driving it is the sum of all auto costs -- purchasing, operating, maintaining, repairing, insuring -- in 2008 divided by the auto passenger miles in 2008. Subsidies for autos include the sum of general funds (property, sales, income taxes) spent on roads minus the sum of gas taxes, tolls, and other user fees that were diverted to transit or other non-highway purposes. 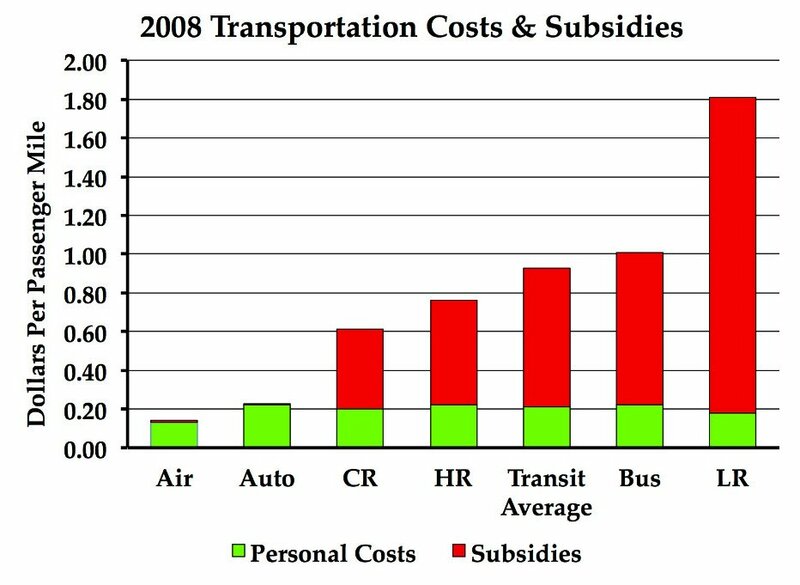 Subsidies for rail transit include amortized capital costs plus annual operating costs minus fares. 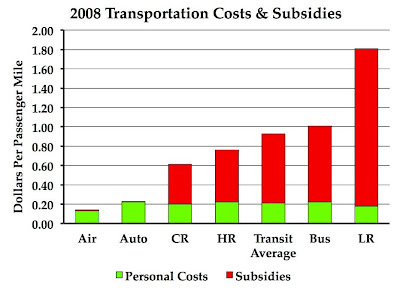 Subsidies to bus transit include total operating and capital costs minus fares. It's pretty obvious on the cost effectiveness of the various options. The investment, as rail advocates have long said, is not about the train. It's about the intense, highly desirable development passengers see out the windows of the train around the station stops. It's about improving incomes, raising property values and attracting the young, productive people who can live wherever they please. It's about building cities we're proud of. So, the cat's out of the bag. The Trib and the rail proponents are about development, not mobility. That would be "desirable development", in case you didn't notice. Desirable according to whom? Rail advocates! We've previously addressed mobility vs. development topics here and here. We are all about improving economic prosperity in the Tampa Bay area. If we want to improve our prosperity, we should have that discussion in spades. Let's not assume there is some economic pot of gold at the end of the rail rainbow. The elevated road that will soon connect the Tampa port to I-4 costs $400 million. The next phase of the reconstruction of I-275 between Westshore and downtown Tampa costs $278.7 million. Widening I-75 from four lanes to at least six lanes from Fowler Avenue to State Road 56 in Pasco County costs $95 million, with another $22.8 million to be spent on widening the busy interstate farther north in Pasco. Highway improvements are essential, but alone they are not enough to keep Tampa and its suburbs competitive with many other cities that are investing heavily in transit. Yes, highway and road improvements are essential, and that is not going away. How convenient they left out any cost numbers associated with the other modes of transportation, as if they are free. They perform an accounting sleight of hand by talking absolute costs, vs. per passenger mile, which is the only way to measure the true costs of the different transportation modes. We refer you to Hillsborough planners consider revised light rail proposal. The centerpiece of the MPO's idea is a "hybrid" light-rail project to showcase what light rail could achieve. The initial project would run only between downtown and the University of South Florida campus. That would be a dramatically shorter route than the one called for in 2010, which would have created a light rail system running from the northeast suburbs to downtown Tampa to Tampa International Airport. The smaller scale of the project also would carry a smaller price tag – in this case, a half-cent increase in the sales tax instead of a full penny. The cost to operate the trains and maintain the equipment, tracks, and stations would range from $8 million to $20 million per year. We remind the reader from the 2010 light-rail referendum the actual cost estimates referendum was $1.2 billion not $800 million. So its not free either. Also missing in this editorial is any reference to the Community Investment Tax (CIT). By 2007 the County Commission blew out our CIT taxes. That money is totally spent and we are now receiving zero dollars from CIT for roads, despite the fact the CIT included road improvement and safety projects through 2026. We are still paying the CIT, and getting no transportation benefits from it. Hillsborough County currently has a huge list of unfunded transportation road and bridge projects. Some decisions must be made. Will we preserve and rehabilitate the existing roads that 98% of us use everyday? Is now a good time to incur additional debts on the “hope” that transit and the promised development will improve Tampa's prosperity? Is that “hope” on your dime a bet you would place with our County Commissioners? Now those same people want more? Their last plans failed. And you can bet they want rail and transit oriented development. Just trust us, they say. Or is it likely they'll prop up rail at the expense of the roads and bus service, which has repeatedly happened in other municipalities that have gone down this path. Will they guarantee no cut backs in bus service and roads, and no further tax increases to cover the rail cost overruns, maintenance and operating expenses, which are the typical remedies to rail plans gone bad? Can we be honest here? This discussion would not be re-opened again if we only wanted to improve the bus service, and open up some low cost private modes of transportation such as shared shuttle services, which we favor. It's only being opened up so the large developers in the Tampa Bay area can build around light-rail. If there is anything we should have learned around here, it is that development is not long term economic prosperity. Tampa Bay needs diversification in its economy besides the developers. Development won't go away, but we should broaden that discussion around realistic growth and prosperity options that are best for Tampa Bay, not more of the same. Where is small business in this discussion? Tampa does need improved transit. Lets have that discussion. But lets not confuse mobility with development with prosperity. Those are three different things. They are not totally independent of course, but lets understand the optimum solutions for each rather than letting developers and other special interests drive to their preferred answer. Here at The Eye we've already started the conversation on transportation to ensure all sides are being heard. You can start reading our posts related to transportation. Just keep scrolling. Need more info? Check out https://www.facebook.com/TBCOST. Be aware Connect Tampa Bay and the Sierra Club are actively organizing to get 100 or more supporters to the March 20th meeting. If you want your voice heard, show up, and sign up to speak. The earlier, the better. 8:30am – sign up to speak, only 45 minutes for public comment, 3 minutes each! If you can't make it, because, you work, or have other commitments, email your county commissioners, or call them 813-272-5660 and leave them a message. Wow, you managed to derail the light rail debate while everyone was asleep at the wheel enjoying their frapachinos and playing video games on their iPhones? It is 2 years later and people have come out in the sunlight and finally see what kind of damage the tea party is doing to this county... to the country. R&R were soundly defeated, especially here in Florida. I hope WE THE PEOPLE sent a clear message to the entire Tea Party. We are going to take this state back. We started with the President. Gov. Scott is next. I don't know if there will be light rail in this county, but that was not the main goal here. The goal was for the county commissioners to see that the citizens of Hillsborough County need more transit options. The one we have currently needs help. It is underfunded, inadequate, and aged and will need the help of the citizens if we are to ever compete with major metropolitan areas. Please be constructive. You can have a point of view, of course, but please back it up with some facts. Even though San Francisco has both a public Rail and Public Bus, many employers find it makes sense to run Private Buses. Do you get the impression maybe the private industry meets its customers needs better than government? So what is your reaction? It should not be that we need to improve public transportation to compete with private, it should be to celebrate that the free market is allowing all these employees to get to work in a more efficient manner.